Last revised 12 August 2008. This Apollo 9 TV screen grab shows a roll of grey duct tape to the left of center in the Apollo 9 Command Module in Earth orbit. Prior to Apollo 16, the crews had a roll of duct tape in the LM but didn't take one outside. 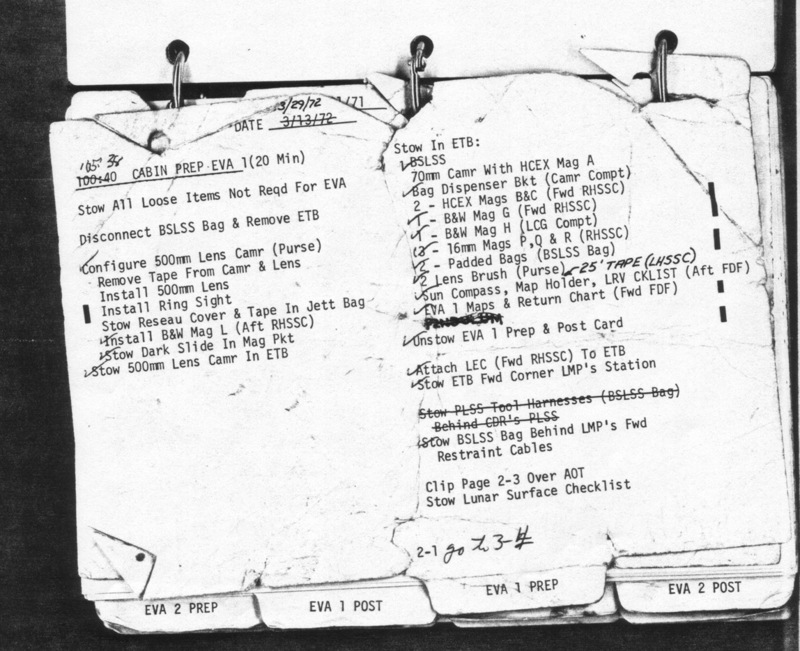 A preflight, handwritten addition to page 2-1 of the flown Apollo 16 LM Lunar Surface Checklist adds a 25-foot roll of tape to the contents of the Equipment Transfer Bag (ETB) during EVA-1 Preps. (Other handwritten changes on the page were made on the Moon by Charlie Duke after the delayed landing forced revisions of plans.) The roll of tape stayed in the ETB. Consequently, Duke and Young always had a roll of tape with them, transferring it back and forth between the cabin and the surface in the ETB. The Apollo 17 crew did the same. Generally, tape was used for repairs and equipment modificiation. Most famously, duct tape was used in the construction of a makeshift device that let Command Module lithium hydroxide canisters be used with the LM Enviromental Control System to prevent a build up of carbon dioxide during Apollo 13. It was also used for such purposes as making a replacment fender for the Apollo 17 Rover, repairing Jim Irwin's broken OPS antenna on Apollo 15, and holding open the solar panels on the Apollo 17 SEP transmitter. Tape worked well when used in the LM cabin provided that, prior to taking a taped item out into the lunar vacuum, gas bubbles were pushed out from under the tape. Taping jobs done on the lunar surface were more problematic because of the dust that covered most surfaces, including the astronauts' gloves. One piece of tape could be used to remove at least some of the dust from a surface before another piece was applied. Pieces of tape could be torn off the roll while wearing the gloves, but care was needed to ensure that an adequate length of tape remained untouched and dust free. Detail from AS13-62-8929 showing some of the duct tape used in construction of the adapter made during Apollo 13 so that square CM LiOH canisters could be used in the LM. ( small and large versions) The EVA guard seen in the Apollo 9 TV frame grab is now in a private collection. A 2007 photo shows the piece of duct tape still in place. Apollo 11 TV/Monitor Assembly Technical Debriefing, Sect. 6.18 They used tape to attach the TV monitor to the camera to cut down on the number of cables floating around. Apollo 11 TV/Monitor Assembly AS11-36-5385 View from the Command Module of Neil in the tunnel, with his upper body in the LM, using the TV to document the LM inspection on the way out to the Moon. Photo shows the duct tape used to attach the monitor to the camera. Technical Debriefing, Sect. 20.7 Mike uses adhesive tape to tape the long-eared comm tube to his ear, because the headset "drives me crazy after a couple of hours, not to mention falling off all the time." Technical Debriefing, Sect. 25.2 Complaint about the amount of waste volume resulting from the food packaging. By plan or otherwise, they used tape to compress the waste into as small a volume as possible, but that was time consuming. 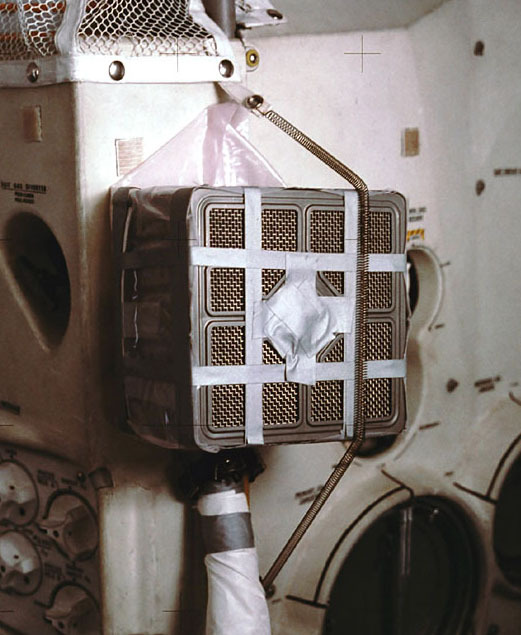 Photograph of the adaptor made from duct tape and other materials so that square, Command Module lithium lydroxide canisters could be used in the LM. Various light sources that would have interferred with the dim-light photography were taped. Technical Debriefing, Sect. 20.19 During a discussion about photography aspects of the flight plan showing up late and not being well thought out, Buzz mentions that he had to use tape the keep the DAC focus at infinity. Scott, from the 1971 Technical Debrief - "We started having some problems hanging up in the cabin. I think that they were magnified by the one-sixth-g environment because we didn't compress the suits as much as in one g, and I think we were both riding a little bit higher, and a little lighter. Turn-arounds within the cabin were very difficult, and my hang-up problems were on the mounting lever, or shaft, that holds the PLSS in the recharge station. Jim finally figured that I was hanging up on that handle, and we put some tape on it, across the handle (opening) on subsequent EVAs, which did help. It was also hanging up on the corner of the Flight Data File, which is a sharp corner, and also on the DSEA (Data Storage and Electronics Assembly) guard, the wire cover. It's very crowded in there, and it takes a lot of time in moving about the cabin to prevent hang-ups. And I think we lost, overall, quite a bit of time." 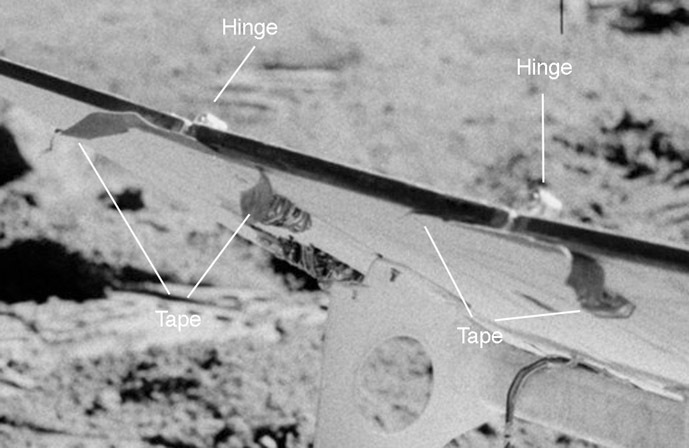 A detail shows Jim's upright antenna with a piece of tape wrapped around the base. Apollo 15 OPS antenna repair, EVA-2 preparations 141:39:51 Dave discovers that Jim's OPS antenna has sheared off just below the nick they discovered and taped prior to EVA-1. Dave tries to devise a way of securing the antenna in an upright condition but, at 141:44:01, CapCom Joe Allen passes along a suggestion that Dave lay the antenna horizontally on top of the OPS, in contact with the remaining stub, and tape it into position. At 141:47:19, Dave tells Joe that taping the antenna in a horizontal position is going to work best. 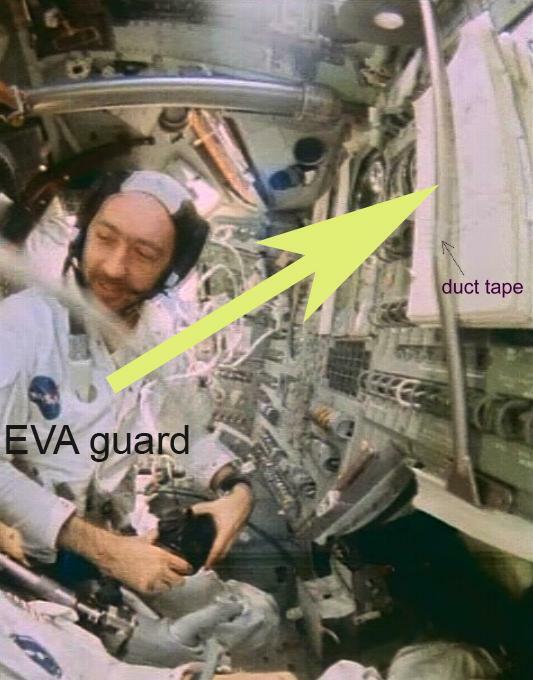 A detail shows the tape job Dave did during EVA-2 preps to secure Jim's broken antenna to the top of his OPS. EVA-2 Prep, cleaning up water leak 140:38:47 Houston asked them to put the water in a cans that had contained the LiOH canisters. Now, as a follow-up to the discussion at 139:06:20, Houston asks that they confirm that they haven't taped the cans closed so securely that they won't depressurize at cabin depress. Dave and Jim tell Hosuton that they did not need to use tape. Tape used to cover suit rips has come off, EVA-2 Close-out 149:03:02 Jim notices "that tape came off (the back of) your PLSS, Dave ... it's ripped on both sides now." Evidently, Dave caught his PLSS on something and they repaired the rip with tape. 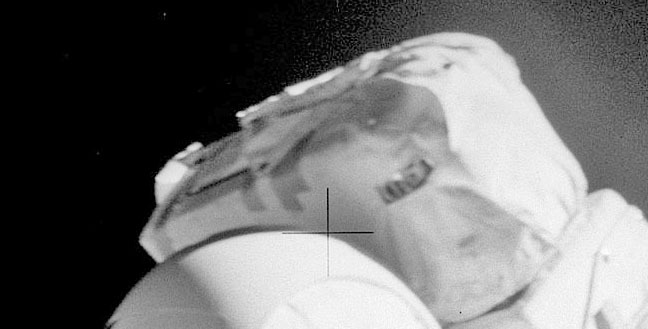 A detail from EVA-2 photo AS15-90-12219 shows what may be a small tear on the righthand edge of the back of Dave's PLSS. 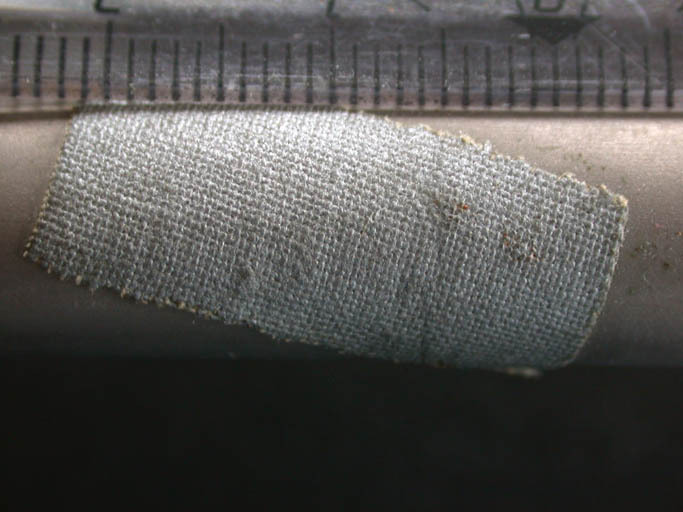 The tape may have come off because it was rubbed off by the same object that made the original tear or because the tape hadn't been strongly bonded to the dust-impregnated fabric. Stowing rock box in the cabin after EVA-2 148:39:34 They are unable to properly stow the EVA-2 rock box. "We couldn't get the rod and pins engaged in the side of the bulkhead to stow that box. So we eventually lifted off with that box sort of loose, although I put a piece of tape across the thing. But we never could get that box stowed." They stowed two rock boxes on this bulkhead; this one was above the other. CapCom asks them to tape the caps 'on the long core stem' before the depress for final jettison. When they brought to cores into the cabin, they had no internal pressure. After cabin repressurization, cabin pressure would presumably kept the caps sealed and prevented any cabin oxygen from leaking in. However, by taping the caps, they are reducing the chances of the caps coming loose at depress if any cabin oxygen had leaked into the stems. CDR antenna cracked at the tip. Houston has them trim the antenna and then use tape to reinforce the top. 126:15:46 CapCom tells the crew, "We've been doing some thinking down here about how to fix the fender. We'll work on it while you guys are getting some rest, (but we think) it's going to involve using utility clamps, from inside your LM there, instead of tape, to fasten some sort of stiff material onto the Rover in place of the missing fender." Gene replies that they have been thinking along the same line because tape "just won't hack it up here," because of the dust. During the rest period, Support Team Engineer Terry Neal devised the way to make and install a replacment fender and John Young tested the procedures wearing a presure suit in a vacuum chamber. John describes the procedures to Gene and Jack at 137:19:09 and, in more detail, at 138:32:00, after the rest period. The replacment fender was made in the cabin by taping together four unneded, contingency maps and later attaching the new fender to the Rover with clamps taken out from the cabin. 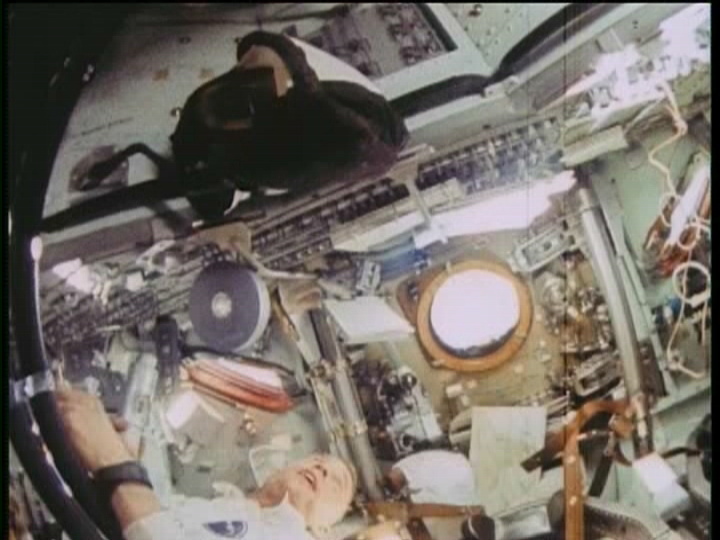 At 137:24:45, John mentions that experience had been gained, earlier in Apollo, with the use of duct tape in the thermal vacuum chamber and stresses the need to press out any air bubbles while taping the maps together. Once out on the surface at the start of EVA-2, Gene and Jack start installation of the new fender about 141:07:19 and complete it in about five minutes. 161:24:03 Jack reports that, in repairing the sample-bag holder on his camera, he used some of the tape that had bundled food packages together. Jack commented that it worked better for this repair job because it was thinner. This view from the back of the Apollo 17 SEP transmitter shows the two pieces of tape that were applied to keep the outer two solar panels flat and in alignment with the fixed, center panel. The ends of the tape pieces wouldn't stick to the back of the panels because of dust picked up from the gloves. 116:16:17 and 116:17:45 The mechanism that holds the flag out straight was broken, causing the flag to droop. During the mission, Pete wished he had a piece of tape to make a repair. In 1991, he explained, "We didn't have any rolls of tape (outside the LM cabin). The tape that I'm referring to, I think, is things like (a piece of tape that) held the lid on the canister of the S-Band antenna. And I'm sure that stuff was either trampled on or gone. I don't really remember this, but I was trying to fix the flag." 118:51:38 While on the porch preparing to crawl into the cabin, Al wonders if they should put some tape over some scratches they made in the hatch at the start of the EVA. He then decides that it won't be necessary and Houston concurs. During the EVA-2 close-out, Jim mentions that, at the end of EVA-1, he had trouble getting the rock box to shut and had to bang it closed with his fist. During the Technical Debrief, he said "we couldn't get the rod and pins engaged in the side of the bulkhead in the LM to stow that box. So we eventually lifted off with that box sort of loose, although I put a piece of tape across the thing. But we never could get that box stowed." In hindsight, the problem was that part of a sample bag was caught in the rear hinge. While Dave and Jim pack the Equipment Transfer Bag (ETB) pack for EVA-2, CapCom Gordon Fullerton requests that they wrap a 1-foot (0.3) meter piece of tape around the CDR's camera so they can use the tape outside to secure the TV cable to the high-gain mast to keep it from interfering with the camera. Later, CapCom Joe Allen suggests that Dave "put some (tape) in your pocket for later", in case they need to make any repairs outside. About a half hour later, Dave decides to put a couple of pieces of tape on his cuff checklist, the only reasonably clean surface he has. The Apollo 16 and 17 crews will keep a roll of tape in the Equipment Transfer Bag so they will always have tape available. Joe asks Dave to tape the TV cable to the high-gain mast. As per Fullerton's earlier request, Dave has already done that with one of the pieces he brought out on his checklist. 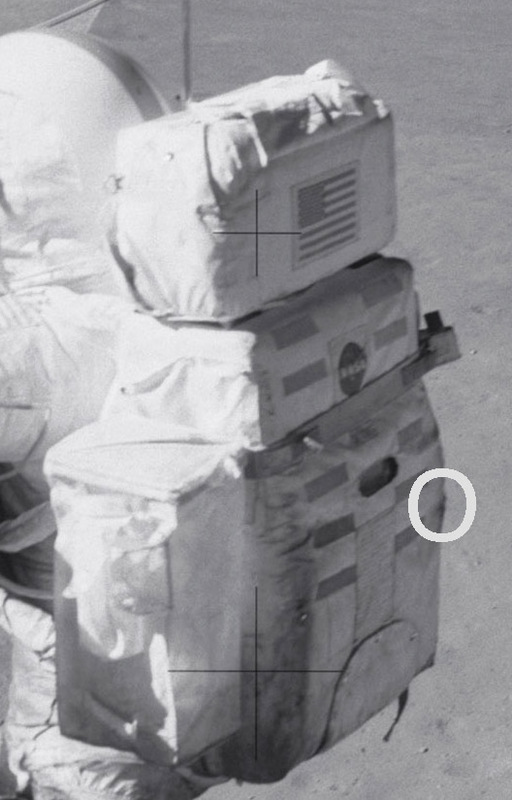 A detail from AS15-86-11602 (left) shows the configuration at the end of EVA-1 of the cables connecting the TV camera to the Television Control Unit (TCU) and the High-Gain antenna to the Lunar Communications RElay Unit (LCRU). 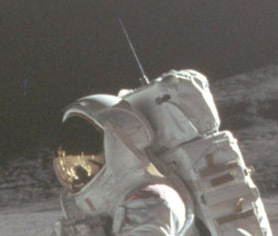 A detail from AS15-88-11866 shows the configuration of those two cable early in EVA-3. A cable connecting the Low-Gain antenna to the LCRU is also labelled. Finally, a detail from AS15-87-11780, taken from Dave's seat late in EVA-2, shows where Dave taped the cable to the mast. Jim has trouble closing the EVA-2 rockbox and comments "Well, I think we probably have a seal, if we keep these handles in this position, because the seal is already made. If we could tape those handles down, we'd probably have a vacuum in there." After CapCom Joe Allen, asks Dave to handcarry the rockbox up the ladder because of the problematic seal, Jim repeats the suggestion at 149:05:39. 122:50:55 After the sample-bag dispenser mechanism on John's camera failed, they tried taping the bags in place. &quot;I had them taped on both cameras, but the tape came up. The gray tape doesn't hold too good on that (dust-coated) metal surface.&quot; The tape comes loose at 148:11:25 and John has more trouble with his bags at 148:26:20. While working around the Rover before joing Jack out at the ALSEP site, Gene accidentally catches his hammer under the right-rear fender extension and tore it off. If they are to avoid getting covered with dust while riding on the Rover, Gene will have to replace the fender. At 118:52:35, he asks Jack if their roll of duct tape in under the CDR seat. At 118:54:51, Gene mentions using tape during training and then starts to tape the fender back into place. His main problem is that the tape doesn't stick well to dust-coated surfaces. He uses one piece of tape to clean the dust off before securing the fender at that particular spot. Good television coverage. He has surprisingly little difficulty tearing pieces of tape off the roll with his gloves. He finishes the taping job at 119:02:59.
they confirm to Houston that it was the fender Gene had taped back in place that came off. At 123:12:04, Gene says, "My tape didn't hold; it was too dusty." The SEP transmitter is powered by three solar panels. The center panel is fixed to the body of the transmitter and the two side panels are connected to the center panel by hinges. The side panels won't deploy fully and Jack has to use duct tape to get them to lie in the same plane as the central panel. Gene tears strips off the roll and gives them to Jack who applies them to the back of the panels. In response to a question, Jack tells CapCom that he taped the back of the SEP transmitter solar panels to keep them open and, therefore, didn't cover any of the solar cells. CapCom requests that, when Jack runs out to the SEP transmitter, he check to see how the tape he put on the solar panels have survived 18 hours out in the Sun. At 141:21:05, Jack reports that the tape has "survived". Photo AS17-141-21510 shows the transmitter from the back early in EVA-3. A magnified detail (above) shows the two pieces of tape Jack used on the back of the solar panels to keep them open. Jack put a piece of tape where each of the side panels joined the center panel. Note that the ends of each piece haven't stuck to the panels because of the dust they picked up from Gene's and Jack's gloves. The center of each piece has stuck because they were able to keep it sufficiently dust free. Down-Sun photo to document LRV location - forthe SEP experimenters - at the start of the traverse. The replacment fender is on the right rear. Photo documenting replacement fender, EVA-2 Station 2 AS17-137-20979 Just before leaving Station 2, Gene takes a picture of the replacement fender. It has survived a 9.1-km drive out from the LM. When they arrive at Station 9, late in EVA-3, Gene says "(The) fender's almost worn out." Becaue of persistent abrasion by material thrown up by the wheel, the aft end of the replacement fender had lost enough stiffness that the back end was folding under and allowing some dust to be thrown up and forward onto the Rover and the crew. Gene brought the replacement fender back to Earth and, as of the mid-1990s, it was on public display at the National Air and Space Museum. See a discussion of the replacement fender, including a photo of the underside taken at Air and Space. Apollo 17 SEP receiver thermal bag, EVA-2 at the LM 140:47:54 Jack reports that the Velcro tabs on the SEP receiver bag have unbonded and suggests taping the cover shut. The covers won't actually be taped shut until 164:00:57, just before they start the EVA-3 drive to Station 6. Handling the tape, Gene says, "I feel like a kid stuck in taffy". Jack checks the seal after turing the receiver on at 164:19:32. Before they leave Station 6, CapCom asks Gene to close the thermal blankets on the SEP receiver and tape them shut. Gene says, "Oh, the tape's not going to stick anymore, I'm afraid." CapCom asks him to try, anyway but, after a few minutes, Houston is more interested in getting them on the way to the next station and tells them to defer taping till they get to Station 7. Al was suprised that some clear tape on thermal blanket covering the MET was difficult to remove. Similar comment to Shepard's. Dave says, &quot;When I opened the blankets, I found that they had been taped together - in addition to being Velcroed - and that took a fair amount of time to get them open.&quot; Additional comment at 120:51:13. Shows extensive use of gold-colored tape to secure the dark-grey insulation blankets covering Quad III (northeast face when landed) of the Descent Stage. Faulty alignment of DAC magazines in the camera may, in part, have been due to a protective piece of tape not being removed prior to magazine installation. Crew gets pre-flight permission - and training - to remove and re-attach their biomets sensors as appropriate. Surgeon will want crew to change "sponges and tapes" on the medical sensors after the rest period. Probably want to check data because of the arhythmias seen up to this time. Dave discusses the overhead added when "we're hurting on time." All the packages for one meal were taped together.